Across the UK, millions of farmed animals are crammed into tiny cages with no personal space. Rabbits for example are denied their most basic needs such as solid ground under their feet, room to move, fresh air and sunlight, and grass to eat. They are kept in cages that are barren, cramped and deny the animals space to move freely, unable to express their natural behaviours or adopt normal postures such as lying stretched out, sitting and standing with their ears erect (species typical “look out” posture) or rearing up to explore their surroundings. They cannot move normally or comfortably, and some don’t even have enough space to perform a single hop. This is bad for their mental well-being, and the lack of exercise can also lead to weakened bones. It is cruel and completely unnecessary as well as being unaccepteable. 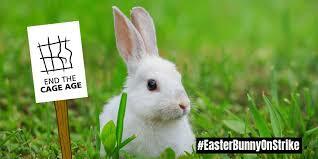 As a result of all this the Easter bunny is threatening to go on strike in protest at the Governments lack of response to the followng petition, that calls on the UK government to end this inhumane practice by banning all cages for farmed animals. There's not a moment to lose so please add your name to the following and show the Easter Bunny that humans do want to stop cruel caged farming, he's counting on your support. Over 30 years or so wandering though charity shops and bookshops I've been drawn to editions of the Penguin Modern Poets, picking up the odd one here and there, they've long been treasured and have been a huge influence on me. Some have been easy to find, but others have been elusive and hard to find, I didn't actively seek them out, just waited for them to appear before me but am pleased to say that this week I have finally completed the set, wonders of wonders .. When the Penguin Modern Poets series was launched in 1962, it's goal was to introduce conpemporary poetry to a much wider audience than had previously been the case. Prior to their release, verse was often published in large and expensive, rather off-putting volumes not readily available to less affluent readers. 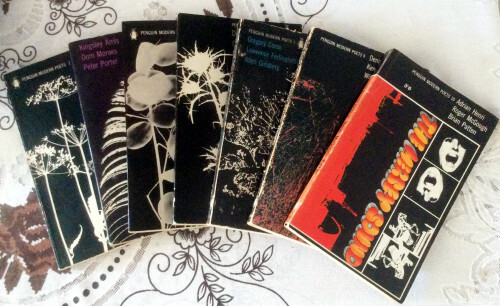 The Penguins, however were slim, inexpensive and therefore readily available to all; as well as being much less intimidating to look at, with beautiful colourful covers, with Alan Spain, Roger Mayne and others creating a distinctive look for them, giving each one it's own collectable identity. Each anthology covers three poets, and a total of eighty one writers containing a large proportion of the most important names in British and American poetry, starting with Lawrence Durrell, Elizabeth Jennings, R. S. Thomas and ending with John Ormond, Emyr Humphreys and John Tripp, were showcased in the series's twenty-seven book run. 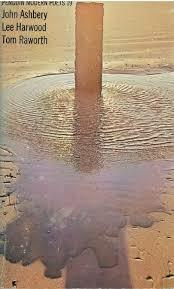 Each book was numbered except for one title (the 10th one),The Mersey Sound, which received a full name. They contained no biographical material or critical apparatus and simply encouraged readers to sample widely and deeply and to compare the merits of the poetries on display. taking in every school of poetry.The series promoted loyalty to modern poetry in general, and of course loyalty to the publisher that championed it. The anthologies became very popular, the tenth collection, The Mersey Sound included the works of Liverpool poets Roger McGough, Brian Patten, and Adrian Henri and went on to become one of the best selling poetry collections of all time. I have personal favourites , the Corso, Ferlinghetti, Ginsberg and the Bukowski, Lamantia, and Norse are particularlywell thumbed, and the Penguins have introduced me to the distictive work of the late Lee Harwood, Kenneth Rextroth, Adrian Mitchell and B.S Johnson whose poetry since have truly appreciated .I must say however that each individual title though stand on their own merit, I love them.Ok darn guess that makes me a materialist, I like wine too but simply adore turning a page, and I return to these Penguins time and time again. Astonishingly all mine are still in rather good nick, since so many of these Penguin’s had glued spines that exploded into dust, have had to replace a few here and there, since former acquaintnces with sticky hands have lifted them, can't really say I blame them, but rather careful nowadays who I let through the door. Though I confess i'm a bit of a hoarder, friends have been free to borrow if asked, , I'm really not that possessive, though. They were followed by a second series of 13 new "Penguin Modern Poets" in the 1990s, and yet another series had its debut in 2016, and has now reached its seventh volume. 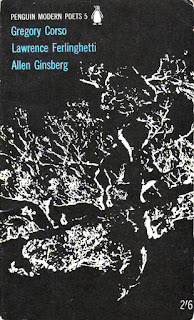 I only have one of these, a collection that includes the poetry of one of my favourite writers Iain Sinclair. These collection are no doubt equally worthy, but they somehow lack the excitement of the original series. Anyway all power to poetry and the poets that create them. On 17 April each year, Palestinian prisoners, the Palestinian people, and supporters of justice and liberation for Palestine all over the world express their support to Palestinian political prisoners and mark the International Day of Solidarity with Palestinian Prisoners.On this day, and throughout the year, families of prisoners often hold protests and vigils holding photos of their imprisoned family members to keep their stories alive. In Palestine, political imprisonment is a central feature of Israeli Apartheid with over 20% of Palestinians facing imprisonment in their lifetime. Palestinian Prisoner Day was founded to remind the world of the thousands of Palestinian political prisoners imprisoned in Israeli prisons or detention centers without charge or trial for extensive periods of time. The number of Palestinian detainess increases as Israeli occupying forces continue to wage campaigns of arbitrary arrests, while Palestinian prisoners in Israeli jails continue to be subject to wide-ranging violations of their rights and dignity.Approximately 6,500 Palestinians are currently held in Israeli prisons and detention centers, including approximately 300 children and nearly 550 held under administrative detention, a form of detention without charge or trial that Israel uses to hold Palestinians indefinitely on secret information. Since Israeli began its military occupation of the West Bank (including East Jerusalem) and the Gaza Strip in 1967, more than 800,000 Palestinians have been abducted and imprisoned by Israel. This figure represents 20% of the total Palestinian population and 40% of the Palestinian male population. It also includes 10,000 women imprisoned since 1967 and more than 200 Palestinians have died in Israeli prisons as a result of torture and lack of medical care.Furthermore, 8,000 Palestinian children have been arrested since 2000.Each year, some 700Palstinian children undergo military detention in a system where ill-treatment is widespread and institutionalised. For these young detiness, few rights are guaranteed even on paper. After release, the experience of detention continues to shape and mark former child prisoners path forward. Palestinian prisoners held in Israel have recently called off a hunger strike that lasted a week after some of their demands were met by Israeli authorities, official Palestinian media and prisoner representatives said.Hundreds of inmates began refusing food on April 8 after negotiations with prison authorities broke down. A statement from the Palestinian Prisoners' Club, a non-governmental organisation said an agreement had been reached to end the recent strike.There was no immediate reaction from the Israel Prison Service. Prisoners had a list of the demands and their strike was supported by all major Palestinian factions.Hamas, which rules Gaza, in particular has objected to new electronic jammers installed in some of the prisons, to block mobile phone reception. The Prisoners' Club said the Israeli side had agreed to stop the jammers.Official Palestinian news agency Wafa said it had been agreed that public phones would be installed in the prisons. Despite the difficult conditions of their detention, and against incredible odds, Palestinian political prisoners actively campaign for their individual and collective rights. In the absence of adequate judicial remedies, Palestinian prisoners and detainees regularly resort to hunger strikes as legitimate peaceful protest to highlight their plight. Fears had been raised of a repeat of an 800-person hunger strike in 2017, which drew attention to prisoners' conditions.In 2017, 1,578 prisoners participated in the hunger strike overall. That protest lasted for 40 days until the Israelis conceded to one of the main demands of the prisoners. They agreed to two family visits a month for the prisoners instead of the one. Palestinians, living under occupation and oppression, have been targeted for mass imprisonment and detention by the Israeli occupation, and nearly every Palestinian household has been impacted by political imprisonment.Investigations have revealed that prisoners are regularly ill-treated, tortured, and denied family visits subject to cruel, inhuman or degrading treatment, including poor detention conditions and denied family visits, not forgetting the policy of administrative detention as a method of arbitrary detention, which results in the jailing of people without trial, on the basis of confidential evidence and without providing a reason and justification for the detainees and their attorneys. These practices contravene fundamental standards of justice and represent Israel’s blatant disregard and violation of international conventions and norms anchored in international humanitarian law and international human rights conventions. in violation of Israel's obligations under international human rights and humanitarian law. Under international law and conventions, including the Geneva Convention relative to the Treatment of Prisoners of War (the Third Geneva Convention), the Fourth Geneva Convention obliges Israel, as an occupying power, to provide allowances for Palestinian detainees, as enshrined in Articles 98 and 81 of the Fourth Geneva Convention. Israel does not honor this obligation. Instead, Israel is punishing the Palestinian government for providing allowances to the families of Palestinian prisoners by pirating Palestinian tax revenues. Every day, Palestinian prisoners are on the front lines of struggle, facing relentless attacks on their rights , despite their difficult circumstances, the Palestinian eople and the prisoners are still full of hope that their days of freedom will come. All of the above are reasons why I continue to support the Palestinian prisoners, and continue to support the international communities efforts to ensure the immediate and effective measures to ensure that Israel releases all unlawfully detaned prisoners, and ensures that conditions of arrest are consistent with international human rights and humanitarian law. Palestinian Prisoners’ Day is also a time where we must reaffirm that there is nothing normal about occupation, apartheid, and mass incarcernation, in any context, and .to continue to stand against state and corporate complicity with Israeli imprisonment of Palestinian political prisoners.and an end of Israel's arrest campaigns, aggressiveness and occupation of the Palestnian territories. 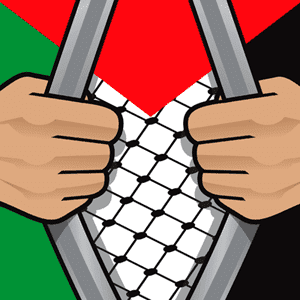 The following link offers the latest facts, figures, and statistics about Palestinian prisoners. the grains that still fall, full of doubts and fears. no matter what we do, we are betrayed. beyond us, no more anguished memories. they are stagnant and void. let's all try and continue until the day we die. April 15 will always remain one of the most sombre days in English football. 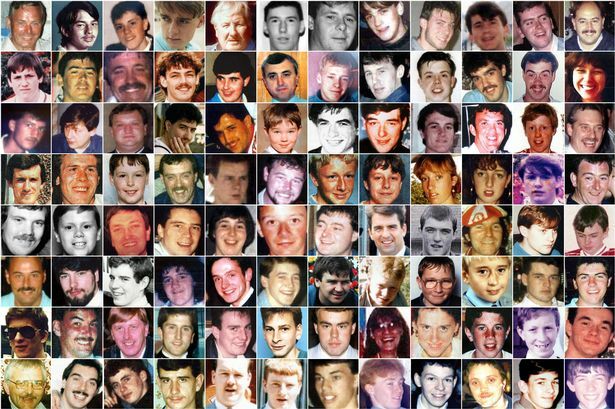 On this day in 1989, 96 Liverpool went to a game of football and tragically never came back. The terrrible events of that day at Hillsborough remain as heartbreaking now as they were 30 years ago. Liverpool will fall silent today for a minute today, traffic will stop in the Mersey tunnels, ferries will sound their horns and the town hall bells will toll 96 times, to mark the anniversary of the disaster at 3.06 today the time the FA Cup semi-final with Nottingham Forest at Hillsborough, was halted, that touched so many lives and changed the face of English football forever. . 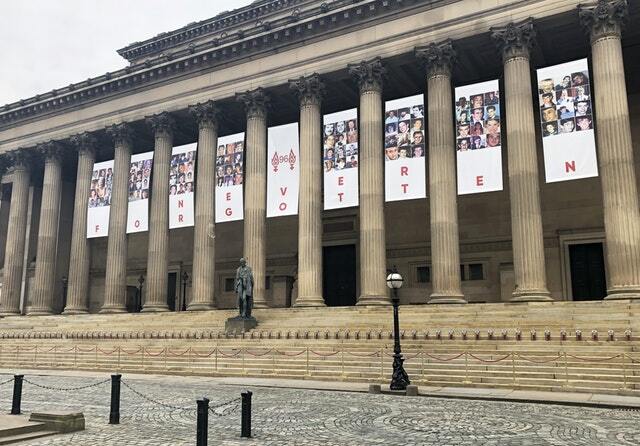 Images of the victims printed on banners, along with the words Never Forgotten, have been put on display at the front of St George's Hall in the city. From Monday morning, 96 lanterns with lit candles will also be displayed on the steps of the hall, where members of the public will be able to pay their respects and leave tributes. "St George's Hall is our city's gathering place, whether to celebrate or commemorate, and I can think of no better venue to host a temporary memorial. "The banners adorned with the images of the 96 will be especially powerful, and the lanterns will serve as a reminder that this city will never forget them." A memorial service is due to be held at Liverpool Cathedral at 2.45pm. The Kop at Anfield will be open between 1pm and 4pm for anyone who would like to sit for a period of reflection. Liverpool FC paid tribute to the 96 during their 2-0 victory against Chelsea on Sunday, holding banners and flying flags in commemoration. Other clubs and players, including former Liverpool forward Michael Owen, also paid tribute to those who died on social media. Plans for a public commemoration event on the steps of St George's Hall were cancelled after a jury failed to reach a verdict in the trial of match commander David Duckenfield, who is charged with the gross negligence manslaughter. The Crown Prosecution Service has said it will seek a retrial, which Duckenfield is expected to oppose, at a hearing scheduled for 24 June. The jury reached a a majority verdict to convict Graham Mackrell, Sheffield Wednesday’s then secretary and safety officer, of failing to take reasonable care of Liverpool supporters’ safety, by allocating only seven turnstiles for 10,100 people with tickets to stand on the Leppings Lane terrace at Hillsborough. Former ​Chelsea star Pat Nevin was quick to remind, more than 96 lives were irreparably damaged on that day. Many survivors still struggle to come to terms with the mental and physical wounds of the incident. It's so horrible to think of going to a match and not returning, never mind it being covered up and being blamed for the tragedy as well. From the onset survivors of Hillsborough spoke of how they were intimidated and threatened by police and left feeling traumatised, accused of wasting police time because they did not like their evidence, because it did not fit into their versions of the event. The Police, the Conservative Government of the time, the Stadium management and the press, all colluded to keep us from what actually happened at the tragedy that was Hillsborough, they were lied about, especially by the police, the scum newspaper, the dead were vilified and labelled, and demonised. 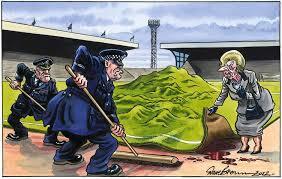 Thatcher's Conservative Government created a culture of impunity, who needed a partisan police force, because they wanted to protect their own self interests Remember too, that 164 police officers lied, 14 of whom were awarded millions of pounds of compensation between them, the Hillsborough familres have not recieved a penny. Also since this terrible occasion some Police Officers were even promoted to senior positions. The propaganda pumped out in the first two years after the disaster coloured public opinion. The Scum newspapers ‘The Truth’ headline, falsely pointing the finger at Liverpool fans, set the tone. The coroner’s dismissive verdict was an official endorsement of the lies. The dead, their fellow supporters who tried to save them and the bereaved were dehumanised, demonised and dismissed with the complicity of the state, .the Police, the Conservative Government of the time, the Stadium management and the press, all of whom colluded to keep us from what actually happened at the tragedy that was Hillsborough. Kevin McKenzie editor of the Scum at the time , sanctimonious git supremeo, sanctioned the making up of 'quotes' he then repeated the same lies time and time and again, a pathetic , wretched individual who only made half apologies in order to further his own self interests. Shame , shame, shame. Because of this, The S*n, as it is referred to in Liverpool, became an instant target. 30 years on and the paper remains unwelcome in the city, the effect of which has led to big supermarkets and small newsagents all over no longer stocking it. Remembrance is thus not only conducted as a vigil for the lives lost, nor the want for it to be rubber stamped in the history books. It is an inherently political act and one which seeks to build solidarity with campaigns fought on similar lines elsewhere. Is crucial that there is accountability and transparency in public life. At a time when members of the Government flippantly spread misinformation and lies because it suits their political viewpoint, the search for the truth is more important than ever. 30 years on it is only natural for people to pursue justice. On this raw emotional day the memory of the 96 will not be forgotten. My thoughts remain with the survivors and those affected by the tragedy as the city of Liverpool comes together to mark this sad occasion. Rachel Carson died on this day in 1964, having revolutionised science and culture. She was born on May 27, 1907, the youngest of three children. Raised in a rustic farmhouse just outside the Allegheny River town of Springdale, Penn, USA, she had ample opportunity to experience the natural world. She credited her mother with instilling in her the lasting love of nature that flows through her writing like a rising tide. She read biology at Pennsylvania College for Women and carried out graduate work at The John Hopkins University.. She then taught at the University of Maryland and at John Hopkins. She was a marine biologist and subsequent editor-in-chief of the United States Fish and Wildlife Service and a pioneer of the conservation movement in the 1960s. She wrote the classic template for the ecological movement with " The Silent Spring " in it she delivered a bracing and alarming story of how pesticides and other toxic chemicals were poisoning the Earth. Carson's terrifying yet inspirational message instantly became a call-to-action for anyone who picked it up. Silent Spring, which drew its name from the prospect of a poisoned world in which no birds sing opened up a ferocious debate and found herself the target of vicious attacks. But she stood her ground. "Man's attitude toward nature," she said, "is today critically important simply because we have acquired a fateful power to alter and destroy nature. Rachel Carson's Silent Spring is credited with waking the world up to the threat we humans pose to our environment, and ignited an environment movement that continues to spark change today. 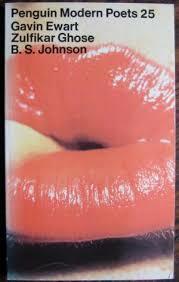 The book captured the attention of President John F. Kennedy and was pivotal in the banning of the commonly used pesticide DDT (dichlorodiphenyl-trichloroethane) in 1972. It led to a grassroots movement questioning the safety of pesticide use and public calls for greater governmental control of the industry. Even now, both the book and the author herself remain icons of how a single individual can change the course of a nation’s history. Carson’s legacy still looms large. As for whether her concerns were “hysterical and alarmist” as her detractors have consistently claimed, or a sobering warning about the impact of human ingenuity, there can be little question that the past 50 years or so have vindicated her. She taught us that no matter how desperate things seem, it’s not too late. While "Silent Spring" is Carson's most famous book, she published several other books, in 1929 as a 22-year-old summer researcher with the Marine Biological Laboratory. She also worked for the Bureau of Fisheries, and conducted research at its station in Woods Hole. In 1949, Carson became the first woman to go to sea on its research vessel, the Albatross III. 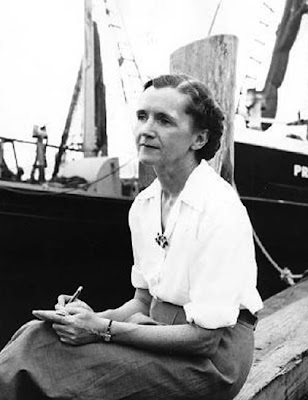 Her trilogy of books, “Under the Sea Wind,(1941)” “The Sea Around Us,(1951)" and “The Edge of the Sea (1955)” were all influenced by her first summer in Woods Hole and her many years working at the Bureau of Fisheries. Carson gained knowledge about the ocean and environment during her years spent there. 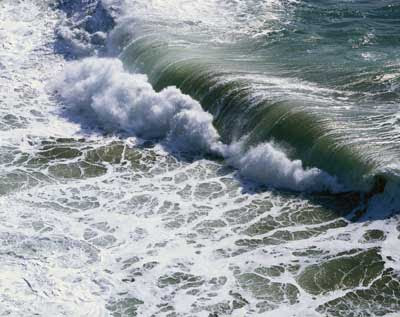 The Sea Around Us has been described as one of the most successful books written about the natural world, it is a poetic narrative about the life history of the oceans. I conclude with a brief extract from The Sea around us. Dyfed-Powys Police have said they are investigating criminal damage to the Cofiwch Dryweryn memorial which has stood as a political symbol on the A487 just outside the village of Llanrhytsted , on the way to Aberystwyth commemorating the drowning of a village near Bala. Stones from the upper half of the wall appear to have been knocked from the structure, destroying the top half of the message. Officers are aware that the memorial has been repeatedly damaged with graffiti over the last few months and that this is causing significant distress both locally and nationally. 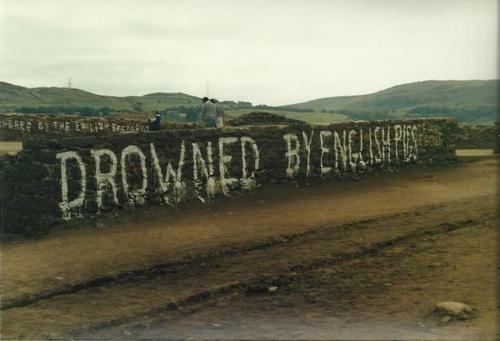 The wall has also been targeted numerous times in the past, including in 2008 when the words were altered to "Anghofiwch Dryweryn" (Forget Tryweryn). Assembly Member for Ceredigion, Elin Jones, tweeted that the vandalism was "a disgraceful affront to our history," and asked "what is the solution" to protect the wall. Delyth Jewell AM added " Shameful. There is something distinctly barbaric about the fct that vandls smashed through the word Remember, A nation is made up of its memories, good and bad. Any attempt to erase that is an attack on far more than just a wall of stones." This year on the 21st October marks the 54th anniversary of the opening of the controversial resevoir in the Tryweryn valley to supply drinking water to the residents of the city of Liverpool, it will be marking a day of grave injustice. The battle began in 1955 when the City of Liverpool were seeking a new water supply. In the summer of that year Liverpool'sWater Committe announced its intention to drown the valley of Dolaneg, where the shrine of Ann Griffiths, the Welsh saint and hymn writer, stands. This of course, provoked uproar. 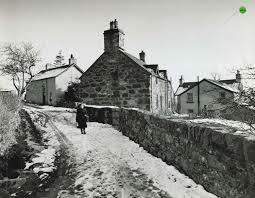 Magnaminously Liverpool bowed to Welsh demands and said they would flood the Tryweryn valley instead. This proved to be a carefully planned scheme to hoodwink the Welsh into thinking they were dictating where a resevoir could be built. In 1956, a private members bill was put before parliament seeking permission. The bill was bought forth by Liverpool City Council, which allowed them to by-pass the usual criteria for planning permission to the relevant landowners in the area. It would involve disrupting railway lines and road links, and at the heart of it, the flooding of the village of Capel Celyn. This was one of the last bastions of Welsh speaking settlements, which had its own school, the site of Wales first Sunday school, post office, a chapel, cemetery and a number of farms and homesteads, it was a community in every sense of the word. Feelings were naturally instantly aroused to fever pitch as the notion of the English drowning out the Welsh, made the symbolism of the creation of the resevoir even more potent. But to members of Liverpool council, the farms that they were drowning were no more than convenient stretches of land along a remote valley floor that could be put to a more convenient and productive use to supply its own citizens with water, but to many was just an arrogant misuse of power, a flooding used primarily as a way of boosting profits. 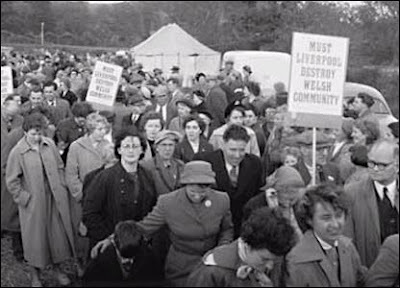 It would be fiercely opposed, such was the passion aroused, on November 21, 1956, the people who had supposedly given Liverpool permission - in fact the entire community of Capel Celyn including their children, marched with banners through the streets of Liverpool protesting against the plan. It would also see a number of individuals being compelled to take direct action against the plan, between 1962 and 1963 there were attempts to sabotage the building of the resevoir, in acts of desperation, since previous passive demonstrations had failed. On Saturday September 22nd 1962, two men were arrested attempting to destroy the site, and then on February 10th 1963 an explosion took place at the site. It remains to this day, the greatest symbol of the struggle of the Welsh language, a way of life destroyed on the whims of a Conservative Government without consultation by Welsh authorities, its people, or the support from Welsh M.Ps, who were to wage an 8 year battle against it. 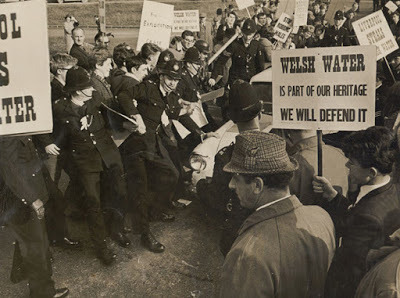 Opposition to the scheme received the backing of the vast majority of the Welsh people, with the backing of trade unionists, and cultural and religious groups. Control over its own water became and has remained an inflammatory issue here in Wales. The political parties were to be united in their opposition to the scheme because it was considered such an affront to the people of Wales, because such valuable resources were being stolen away from the country. The agricultural value of the land was rich compared to some land that could have been considered. 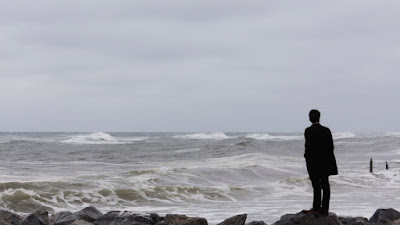 A feeling of great sadness because a community was being shattered and families who had lived in the area for generations were being forced to lose their homes. When on Thursday, October 21st, 1965, the Lord Mayor of Liverpool came to open Tryweryn dam ( built at a cost of £20 million) where every house and tree had dissapeared, to be met by a vast crowd of protesters, in 19 October 2005 Liverpool City Council finally issued an apology, but many thought it was just a worthless political gesture that had arrived far too late. The tragic lessons of Tryweryn and it's reverberations are still felt to this day. The place names like bells still ring out- Hafod Fadog, Y Ganedd Lyd, Cae Fado, Y Gelli, Pen Y Bryn Mawr, Gwerndelw, Tyncerrig, Maesydail. These bells now ring underwater and are heard by no one. An evocative image, forever stitched in time, which remembers the bells of Cantre'r Gwaelod and the loss associated with inundation. It would also feed the flames of a resurgent nationalism, re-igniting the imagination, peoples identity and defence of the language? Y iath, and would pave the way for devolution, and the strengthening and protection of the Welsh Language alongside the growth of Cymdeithas Y Iaith /The Welsh Language Society. There is now a memorial on the side of the lake and a memorial garden and the grave stones from Capel Cemetry have been moved here. At the end of the day it was not just a stretch of land that was flooded against the people of Wales's will, but a whole community of people, a culture and a language because of colonial arrogance and misuse of power. 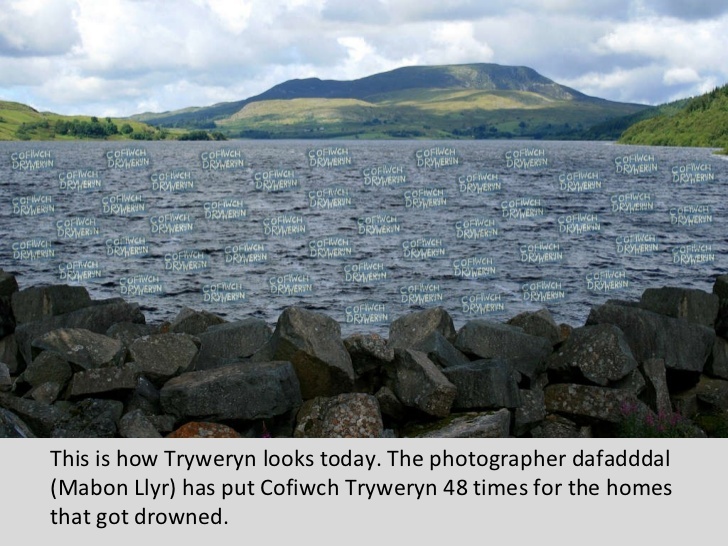 Tryweryn remains as a byword for shame and a grave injustice. Years later it would inspire the Manic Street Preachers to ask " Where are we going"?" in their song " Ready for Drowning, " and the following much anthologised poem by R.S Thomas. A tragic story that we must continue to share. Reminding us of our history and our land, and how it has been exploited to serve the interests of others. 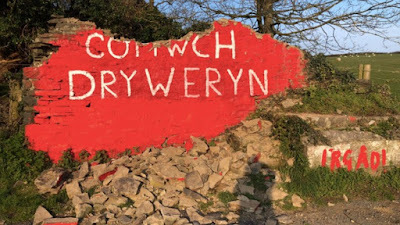 Campaigners are currently fundraising to rebuild the Cofiwch Dryweryn mural. A GoFundMe page was set up by Elfed Wyn Jones, one of those who had repainted the mural erlier this year with members of Aberystwyth's Cymdeithas y Iaith after it was defaced with the word "Elvis" It had raised almost £2000 in a few hours. Following yesterday’s vandalism Elfed Wyn Jones said “I’ve had enough of the Welsh Government being supine and unwilling to protect this mural. They jumped at the chance to save that Banksy in Port Talbot." 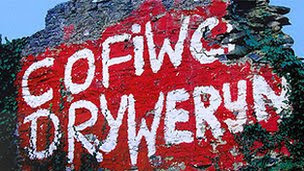 The message of 'Cofiwch Dryweryn' is such an important one to Welsh people, and it should never be forgotten, a poignant symbol of when overwhelming voices were ignored by Westminster. In dramatic scenes Australian Wikileaks founder, whistleblower and international journalist Julian Assange was arrested on Thursday morning at the Ecuadorian embassy after the Lenin Moreno administration removed his political asylum. Previously Assange had diplomatic asylum and had lived at the embassy since 2012, eventually gaining Ecuadorian citizenship after efforts by Sweden to have him extradited on allegations of sexual assault. Assange has vigorously denied the charges, insisting they were part of a plot by political enemies to silence him. We should however be forever mindful though of those who have sought some form of justice, when they feel they have been wronged despite the fame or infamy of those that they happen to accuse. RT affiliate Ruptly captured his arrest as several UK police officers dragged him out of the embassy into a police van. 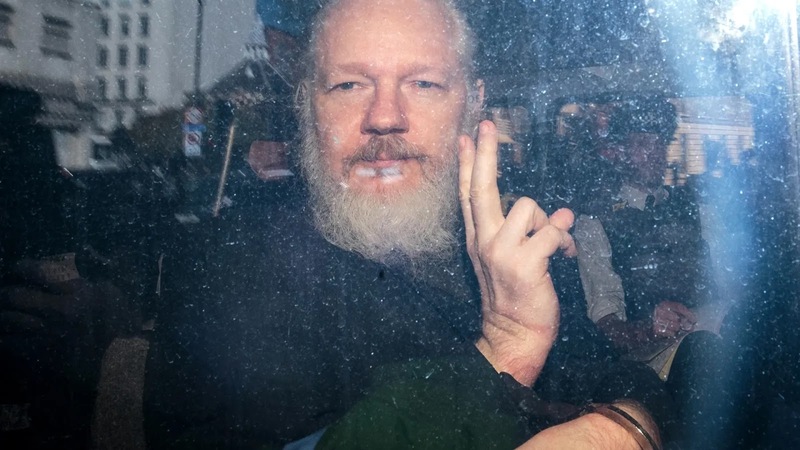 In the video, Julian Assange can be heard screaming, “The UK must resist this attempt by the Trump administration” as he was hauled into the van. Shortly after, the U.S. government confirmed that Assange has been charged with computer hacking crimes for trying to illegally access "secret" materials on a U.S. government computer. The charge is officially listed as "conspiracy to commit computer intrusion." The charges are aimed at the theft of information rather than the publication of material. Those materials included thousands of US military and diplomatic files exposing controversial US military actions in Iraq and Afghanistan.Those actions included evidence of torture, a video of a US Army helicopter attack that killed two journalists in Baghdad in 2007, and the large numbers of civilian deaths that resulted from US combat action. They also relate to materials released by former Army intelligence analyst Bradley Manning, now known as Chelsea Manning, who was convicted in 2013 of leaking classified government and military documents to WikiLeaks. She had worked as an intelligence analyst in Iraq and was arrested in 2010.The US government alleges that Assange tried to provide direct assistance to Manning in her efforts to access some of documents by cracking an encrypted password. Manning had part of the password, but needed help unlocking the rest of it. The charges say she provided copies of the Linux system to Assange, though in the documents made public so far, it does not appear he was successful in decrypting the rest.Manning was jailed again last month for refusing to testify to a grand jury investigating WikiLeaks. U.S. District Judge Claude Hilton ordered Manning to jail for contempt of court in March after a brief hearing in which Manning confirmed she had no intention of testifying. All the while, Assange was secluded in the Ecuador embassy. Assange is currently being held at London police station where he will await an appearance at the Westminster Magistrates’ Court, on May 2 t prison video link , in relation to the extradition WikiLeaks has consistently highlighted that its founder and former editor Julian Assange has been arbitrarily detained 8+ years without charge by the UK Govt (6+ years within the Ecuador Embassy in London) and 2 years house arrest. Academics and campaigners have condemned large chunks of the indictment that they said went head-to-head with basic activities of journalism protected by the first amendment of the US constitution. They said these sections of the charges rang alarm bells that should reverberate around the world. The arrest marks a dramatic twist in the trajectory of Assange’s career, an arc that has seen him hailed at times as a heroic free speech advocate, a villain to others, who when he decided to uncover the mass secrets of global war crimes, espionage and dirty corporate deals, had to fight his own instinct to keep these secrets unexposed so as to protect himself. He knew that he could spend his entire life in prison, and ironically a few weeks ago through a leak people were alerted that the US was gearing up to give Julian the final blow. A secret plan was hatched to have Julian extradited - and his struggle terminated. Now a European country, the United Kingdom, has given in to pressure from Donald Trump, and has handed Julian over. This amounts to nothing less than a coordinated crackdown on a journalist and activist: and this is part of the authoritarian shift that is taking place world-wide – from the US to Turkey, from Hungary to Brazil, and now from Ecuador to the UK. The brave actions of whistleblowers strengthen transparency and democracy but Julian is now in custody for breaching bail conditions imposed over a warrant that was rescinded. Anyone else would be fined and released. Except that Julian Assange’s persecution is all about challenging our right to know about the crimes governments commit in our name. Assange has long said Wikileaks is a journalistic endeavor protected by freedom of the press laws. In 2017, a UK, tribunal recognised Wikileaks as a "media organisation." Wikileaks under his stewardship has become a thorn in the side for governments, particularly Western governments, revealing the ugly truth of crimes committed by US forces in Iraq, the West’s role in the destabilization of Ukraine in 2014, the destruction of Libya etc. If Assange is convicted or extradicted we will inch slowly away from being an open society, and the only people who will benefit are the ones who really have something to hide, and they are the ones we should be worrying about the most. Numerous people and organisations have since reacted with alarm on news of Assange's arrest.Here are a selection. And at Parliament Diane Abbott, Shadow Home Secretary spoke eloquently about the importance of whistleblowers, the contributions of WikiLeaks in revealing war crimes and that her side of the House would be very concerned about a US extradition for Julian Assange. Ms Abbott heaped praise on the activist for exposing activities relating to “illegal war, mass murder murder of civilians and corruption on a grand scale”. And Leader of the Labour Party Jeremy Corbyn backed her words in Parliament with an unequivocal statement of support calling on the government to oppose the extradition of Wikileaks co-founder Julian Assange to the US. The Labour leader suggested that Assange – who faces charges of conspiring to break into a classified government computer – could be sent to the US for “exposing evidence of atrocities in Iraq and Afghanistan”. Freedom of the press is under attack; first, it’s WikiLeaks, but overall this could set a precedent for journalists all over the world.We should not forget Assange for what WikiLeaks has exposed, and we must oppose the attempts to gag him. In the aftermath of his arrest, what happens next could pose a serious threat on journalism and the future of free speech in general. Julian Assange, as was Chelsea Manning, as will be Edward Snowden if he dares set foot outside Russia, is being punished for exposing the thin veil of freedom, human rights and civil liberties.They lied about Iraq, they lied about Libya, they lied about Syria, and they lie every day about the murky relationships between governments and corporations.
" Neither misery nor folly seems to me any part of the inevitable lot of man. And I am convinced that intelligence, patience, and eloquence can, sooner or lateer, lead the human race out of its self-imposed tortures provided it does not exterminate itself meanwhile. 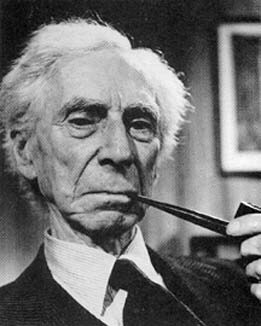 On the basis of this belief, I have had always a certain degree of optimism, although, as I have grown older, the optimism has grown more sober and the happy issue more distant. But I remain completely incapable of agreeing with those who accept fatalistically the view that man is born to trouble. The causes of unhappiness in the past and in the present are not difficult to ascertain. There have been poverty, pestilence, and famine, which were due to man's inadequate mastery of nature. There have been wars, oppressions and tortures which have been due to men's hostility to their fellow men. And there have been morbid miseries fostered by gloomy creeds, which have led men into profound inner discords that made all outward prosperity of no avail. All these are unnecessary. In regard to all of them, means are known by which they can be overcome. In the modern world, if communities are unhappy, it is because they choose to be so. Or, to speak more precisely, because they have ignorances, habits, beliefs, and passions, which are dearer to them than happiness or even life. I find many men in our dangerous age who seem to be in love with misery and death who grow angry when hopes are suggested to them." their simply taking the piss. As the Israeli election takes place on April 9, 2019 the Palestnian people will mark the 71st year since since two extremist, underground, paramilitary groups, the Irgun (National Military Organisation) and the Lehi (Fighters for the Freedom of Israel, also known as the Stern Gang), both of which were aligned with the right-wing Zionist movement; they have been described as “Jewish terrorist” groups attacked in the early hours of the morning Deir Yassin, a village at the western entrance of Jerusalem containing 750 Palestinian residents. By the time the villagers realized the intensity of the terrorist attack, hundreds were already dead, the Zionist militia murdered over 250 - 360 Palestinian villagers in cold blood wounding many others. Many of the bodies were tossed in the village well, and 159 captured women and children were paraded through the Jewish sectors of Jerusalem. What happened in Deir Yassin prepared the ground for the ethnic cleansing of 70% of the Palestinian people. The same ethnic cleansing that occurred then is unfortunately going on today. In 1948 they used direct massacres, but today they use airstrikes in Gaza and shoot innocent young Palestinians in the West Bank. Yassin was not an isolated incident; such a heartbreaking tragedy was flagrantly carried out in conjunction with “Plan Dalet.” Based on a policy of ethnic cleansing and terror, “Plan Dalet” was implemented by the Haganah to force Palestinians to flee their homes and to destroy their villages with the deliberate intent of establishing the State of Israel on Palestinian soil. The village lay outside of the area assigned by the United Nations to the 'Jewish State'. It had a peaceful reputation, the Deir Yassin villagers had signed a non aggression pact with the leaders of the adjacent Jewish Quarter, Giv'at Shaul and had even refused military personnel from the Arab Liberation Army from using the village as a base.An Israeli psychiatric hospital now lies on the ruins of Deir Yassin, the remainder of which was bulldozed in the 1980s to make way for new settlements and incorporated as a neighbourhood of Jerusalem. These streets shamefully carry the names of the Irgun militiamen who carried out the massacre.A year later the settlement Kafar Shaul was founded on this site. In the 1980's the remains of Dier Yassin wwere bulldozed to make room for new settlements. The streets of these new neighbourhoods were named after members of the Irgun family.For Palestinians and their supporters, the massacre is a symbol. that marks their deep sense of dispossession.News of the indiscriminate killings sparked terror among Palestinians, causing many to flee from their towns and villages in the face of Jewish advances.It is remembered as the pivotal onset of the 1948 Nabka. Deir Yassin is the "other shoe that fell," sparking over 750,000 to flee from their homes, 80 percent of the population at that time, from their homes so that Israel, a colonialist settler state, could be created on their land.Over two million scattered in a far-flung diaspora today, in what remains at the heart of the Israel/Palestine conflict. 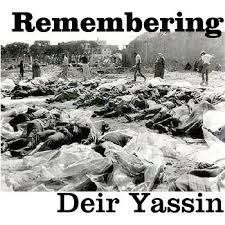 The massacre at Deir Yassin is what many historians and commentators have described as a relentless effort to destroy Palestine as a nation, acting as a reminder of the inhumanity and brutality at the heart of the ongoing occupation and refugee crisis.in what many historians and commentators have described as a relentless effort to destroy Palestine as a nation. Seventy one years it still remains an important reminder of Israel’s systematic measures of displacement, destruction, dispossession, and dehumanization.In keeping with Simon Wiesenthal's observation that "Hope lives when people remember," the suffering of the Jews has been rightly acknowledged and memorialised. But there are few memorials for Palestinians who died in 1948 and since. Their history, in which the massacre at Deir Yassin is a very significant event, has been largely buried and forgotten. And yet, like the descendants of the victims in Armenia (1915-17), in the Soviet Union (1929-53), in Nazi Germany (1933-45), in China (1949-52, 1957-60, and 1966-76), and in Cambodia (1975-79), the descendants of Palestinians want the world to remember what they suffered, what they lost and why they died. The calculated efforts by Israel to completely erase the history, narrative and physical presence of the Palestinian people will not be simply ignored or forgotten. It also serves to ask ourselves the question what turns a victim into an abuser,a bully that keeps blaming its victims? And over the years we've been taught many things, that invasion was not invasion, occupation was not occupation, apartheid was not apartheid,ethnic cleansing was not ethnic cleansing,and that land theft was not land theft and Palestine was not Palestine. But many years later the Palestinian peoples collective voice can still be heard from the refugee camps of Lebanon, Jordan and Syria, to the towns of the West Bank and Gaza, to the ghettos inside the Israeli green line. This determination and resilience has earned them respect and support of an increasing number of people around the world. Despite the humiliation and pain of their occupation, you can't kill their indomitable spirit and struggle. Just an individual based in West Wales, I follow freedoms breath and international solidarity. This blog just random stuff, some borrowed some new. Write a bit of poetry which I sometimes share here. My brain socialist, my head anarchist, my eyes pacifist, my blood revolutionary, laughter is the best medicine, but there are other ways. I try to keep dancing. The truth of Charlie Chaplin's 1940's anti war message for all humanity rings down the ages. How would you describe a stereotypical Nick Cave fan? 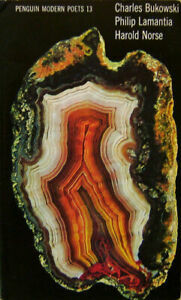 We all have a perception of you, how do you perceive us? SHOUTS – Music from the Rooftops! | Sharing socially conscious music by artists from around the globe. "In our age there is no such thing as 'keeping out of politics.' All issues are political issues. " - George Orwell"